Preparing the patient and the physician for the neurological examination. The patient should be awake and alert, sitting on the examining table facing the examiner. The room should be quiet and adequately illuminated. It is imperative that the patient is naked, save the patient's underwear and hospital gown, to perform a full, initial neurological screening of the patient. Future or serial examinations may be more directed and may not require removal of clothing. It is also important that the patient is cooperative, non-intoxicated and is able to follow commands during the examination. If this is not the case, then errors may occur. Eyeglasses, if required, should be worn by the patient and are a requisite to perform a full ophthalmologic examination. It is key for the physician to be prepared as well. When the physician is well versed with the organization of the neurological examination, is equipped with the correct tools, and is constantly anticipating the next part of the examination, the exam will run smoothly and rapidly with minimal patient discomfort. The physician should have a basic expectation, derived from the history taken previously, of what neurological findings may be present in a patient before an examination. These expectations must be tested and confirmed during the exam to establish a working diagnosis. One must remember to fully examine a patient and be very objective when results are documented, because initial expectations are often incorrect. In summary, it is important to fully examine a new patient and keep an open mind. The tools required to perform a neurological exam. There are six basic tools required. The reflex hammer and accessories. The reflex hammer is used to illicit deep tendon reflexes throughout the body. This important item may come with detachable pin and brush accessories that are used to test for the sensory modalities of pin prick and light touch, respectively. If your reflex hammer does not have these items, then a common safety pin will be an adequate replacement. The 256 hertz tuning fork. This item has multiple uses during the exam. It is used to test vibration sense throughout the body, to evaluate conductive versus neurological hearing loss, and may be placed under either warm or cold water (remember to dry it off before use) and then utilized for temperature sensation evaluation. Although one may purchase 126 and 512 hertz tuning forks (the 512 is better for auditory evaluation and the 126 is optimal for vibratory examination) the 256 hertz fork is adequate for an initial examination of both modalities. To cause the fork to vibrate, wrap it sharply on the palm of your hand before each time you touch its base to the patient's skin. This instrument is used to observe the optic disc, fovea and retina vessels. The light projected by the ophthalmoscope can also be used to test pupil light responses and then the scope itself may be followed in space to assess extra-ocular muscle movements. If one is without an ophthalmoscope, a light pen may substitute for pupil light response and extra-ocular muscle examinations. The ophthalmoscope is the most commonly underused tool in the neurological exam. This card is placed approximately 14 inches from the patient's face, and while the patient is wearing their glasses, if required, gross visual acuity is assessed. A reference for pupil diameter is also found on these cards. This item may be manipulated so the cotton tip is teased out to a fine point. 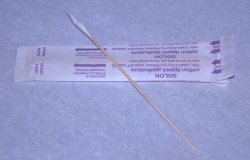 The tip is used to test the corneal reflex by placing the end of the cotton wisp on the cornea, not the sclera, and checking for the eye to respond by blinking. These Q-tips may be pilfered from any hospital storage room. 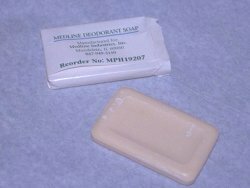 It is important that a small bar of soap is carried by the physician in a small, convenient box. The soap is used to test the olfactory nerve. Some physicians prefer to carry a small vial of coffee grounds instead of soap. Soap is essential in evaluating the patient with possible head trauma or a history of inhalation of toxic fumes. Head trauma may lead to a fracture of the cribriform plate causing possible leakage of CSF fluid out of the nose. Noting a loss of olfaction (due to a disruption of the olfactory nerve roots where they cross the cribriform plate) with CSF rhinorrhea, in a patient with a history of head trauma, helps establish a diagnosis cribriform plate fracture.